Nutrition is the most important aspect for endomorphs. 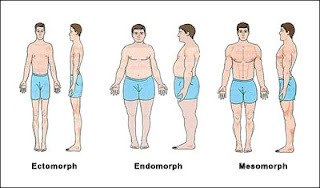 I've noticed that endomorphs are sensitive to carbs or more specifically, to insulin. To make things worse, endomorphs typically consume too many carbs throughout the day for their body type. As a result, they will retain water in the ab region as well as in their feet. Because of endomorphs sensitivity to carbs my recommendation is that their protein intake should be more than their carb intake. I would start by implementing a diet with a 1:1 ratio of carbs to protein. In other words, if you weigh 200 pounds, you'll consume 200 grams of protein and 200 grams of carbs per day. Assuming you'll eat six meals per day, this equates to about 30 grams of protein and 30 grams of carbs per meal. Also be sure to keep track of your daily caloric intake. Depending on your results after a couple of weeks, You may decrease the total amount of calories per day and or the ratio of carbs to proteins if your weight loss is not sufficient. I suggest cutting calories by 500 cals per day and keep protein and carbs intake equal. 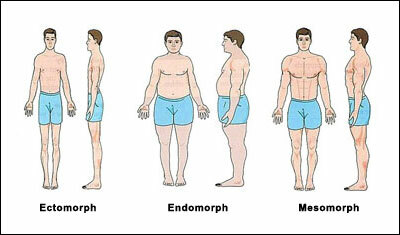 Endomorphs are typically insulin sensitive, so the type of carbs he or she consumes is extremely important. The term “glycemic index” (GI) is important to know and understand. The glycemic index of a carb basically indicates how fast it is converted into sugars that enter your circulation. In short, the glycemic index measures the rate blood sugar levels rise after eating something which in turn tells you the amount of insulin that is produced in response. Why is insulin so important? Insulin basically performs two functions: (1) it stores fat and (2) it prevents fat from being broken down to a usable energy source for the body. When dieting, you want to limit the amount of insulin you produce. We accomplish this by selecting carbs with low glycemic indexes. I don't worry too much about fats since fats usually limit themselves (depending on the type of protein you are eating). To summarize, because of the endomorph's predisposition for insulin sensitivity, his or her diet should focus on limiting (and wisely selecting) those carbs with low glycemic indexes. He should try to consume smaller meals more frequently in an effort to maintain a steady blood sugar level. Finally, his or her training program should have a solid aerobic foundation. I have found that this type of overall program best facilitates fat burning. If you are an endomorph, remember that success depends on your ability to believe in yourself. Nutrition and eating habits makes you eat less of some foods and more of others. Diet should be combined with exercises to lose weight otherwise you will be never able to lose the weight. Hydration and fiber-intake are top priorities. Drinking water helps to transport the flow of nutrients and flush out the waste products. Drink a Gallon of water per day this will help with fat loss!!! Lower fat intake all-round (up to 20% only of total intake). Eat more proteins. Proteins such as turkey, fish, chicken, whey protein, shellfish and salmon. Grilled or Baked if possible!! Endomorph diet should include olive oil, flax oil, peanuts, almonds, canola oil, and walnuts. Carbohydrates such as green vegetables, green beans, all beans, cabbage, oat meal, salad lettuce and berries. Don’t avoid carbohydrates, but reduce the intake of carbohydrates. Eat slow absorbing carbohydrates. Slow absorbing carbohydrates include brown rice, grains, fruits, vegetables, oatmeal, whole wheat bread, sweet potatoes, stay away from breakfast cereals most are loaded with sugar, whole wheat pasta. Green leafy carbs eat as much as you want but for carbs such as brown rice, beans, sweet potatoes, oatmeal eat the amout equal to the size of your palm only!!! Also try to only eat green leafy carbs after 4pm the later in the day you eat your carbs the more likely your body will not burn it off before you fall asleep. Eat smaller meals, more often to sustain your energy levels and to keep your blood sugar levels stable.